Vapor King eTank has earned 4 STARS and is RECOMMENDED WITH CERTAIN RESERVATIONS. Add one-half star if you prefer three-piece designs. We had heard a lot about the Vapor King eTank cartridges, atomizers and batteries, so we were excited to test this company’s starter kit. Opening the Vapor King eTank Starter Kit, we discovered a tray that held two 2. 5 inch, five-volt batteries and two atomizers. Beneath this were two boxes that held the kit’s USB charger, the AC wall adapter and five cartridges. This was all that we needed to get started, so we attached one of the atomizers to a battery. They fit together well and had an obviously high-quality finish. In fact, the solid construction and fine craftsmanship of this product are the best that we have ever seen. Fully assembled, it looks much better than many other e-cigarettes that do little to dress up their products. Vapor Kings is an excellent choice for electronic smokers who enjoy filling their own cartridges as well as those who prefer three-piece designs. Next, we took out one of the cartridges. These also were unusual when compared to products that we had previously tested. Constructed of translucent black plastic, they displayed the e-liquid contained inside, making it easy to decide when to replace or refill the cartridge. We inserted the cartridge into the atomizer barrel and turned it gently to fix it properly inside. The entire device measured out to about 4.5 inches in length and was somewhat poorly balanced. We took a long drag on it and were amazed by the seemingly endless plume of vapor that we exhaled. With the next drag we noticed how the LED tip glowed blue and then exhaled another excellent cloud of vapor. Few of the numerous e-cigarettes we have tested could match the Vapor King in terms of vapor volume, the most notable of which being Green Smoke paired with its FlavorMax cartomizers. We even tested the two side-by-side but were unable to decide whose vapor cloud was superior. However, all of us could agree that Green Smoke was the more enjoyable product owing to its superior flavor. Vapor King’s tobacco flavor had a faint burnt taste. While Vapor King’s flavor is certainly superior to that of many lesser e-cigarettes, it is not amongst our top five. We were however, disappointed by maintenance issues with the Vapor King cartridge. It tended to leak if we left it uncapped. Even when capped, the nicotine liquid leaked into the rubber cap. We were required to wash our hands several times during the testing to keep the smell off our fingers. While we found much to admire about the Vapor King eTank, we must note that it is a three-piece design. At eCigs HQ, we have been quite vocal about our preference for two-piece devices. The extra component in a three-piece design simply adds another element that might break or need to be replaced. We believe that Vapor King should work towards incorporating atomizers into their cartridges so that the consumer can simply throw away the entire cartridge/atomizer when finished with it. There remain however, die-hard electronic-smokers that strongly prefer three-piece designs largely because they provide the ability to refill cartridges with the e-liquid(s) of their choosing. Vapor King’s eTank cartridges are refillable with e-liquid that may be purchased separately and is available in various flavors and nicotine strengths. However, it remains our belief that two-piece designs are superior and we will continue to express this preference in our rankings. Further, we find it highly inconvenient to carry around bottles of nicotine liquid to refill our electronic cigarettes. 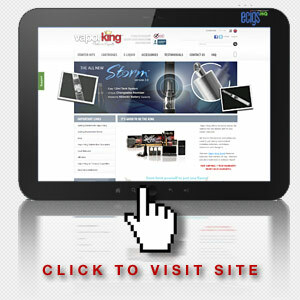 In short, we consider Vapor King to be an excellent value. Although the taste is not our personal favorite, many will find it enjoyable, while the cartridge/atomizer combination produces superior amounts of vapor. Vapor Kings is an excellent choice for electronic smokers who enjoy filling their own cartridges as well as those who prefer three-piece designs. We estimate that the cost of maintaining a pack-per-day habit with Vapor King products would be $806.30 each year. This cost includes the price of the starter kit. If you compare this to the cost of maintaining the same habit with real tobacco cigarettes, you can see a great opportunity for savings. That regular tobacco habit would cost $6.00 per day or $2,190 per year. Annually, you could save close to $1,400 a year by switching to Vapor King electronic cigarettes. First click the Vapor King eTank website link below. To receive 15% off your Vapor King eTank order, enter 15vaporking02 in the Coupon Code box at checkout.